.Valentine’s day offers brands a significant opportunity to be creative and inspirational. This blog post looks at how retailers are engaging their audience this Valentine’s Day. Evian and We Are Social have launched a creative campaign called ‘I Love You Like’ to celebrate Valentine’s Day 2014. They are encouraging people to express their feelings for loved ones and have fun while avoiding clichés associated with the special day. To get involved in the competition fans have to complete the phrase ‘I love you like …’ on either Facebook, Twitter, Instagram or Pinterest. They will then have a chance to win exclusive prizes. This campaign works particularly well as it is an engaging way for the brand to interact with its audience. 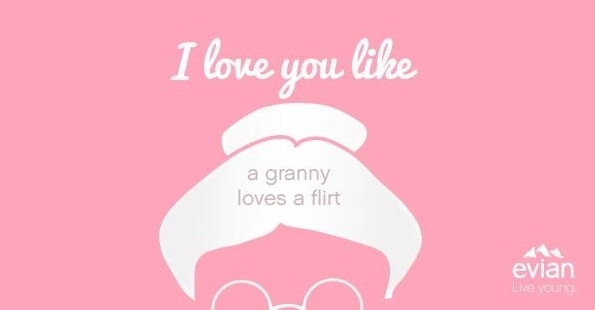 As well as spreading the love over a range of social media around Valentine’s day. This also promotes Evian’s ‘Live young’ philosophy. It doesn’t just represent an opportunity to sell products but also the opportunity to help people to fall in love with their brand by showing a playful and fun-filled factor. 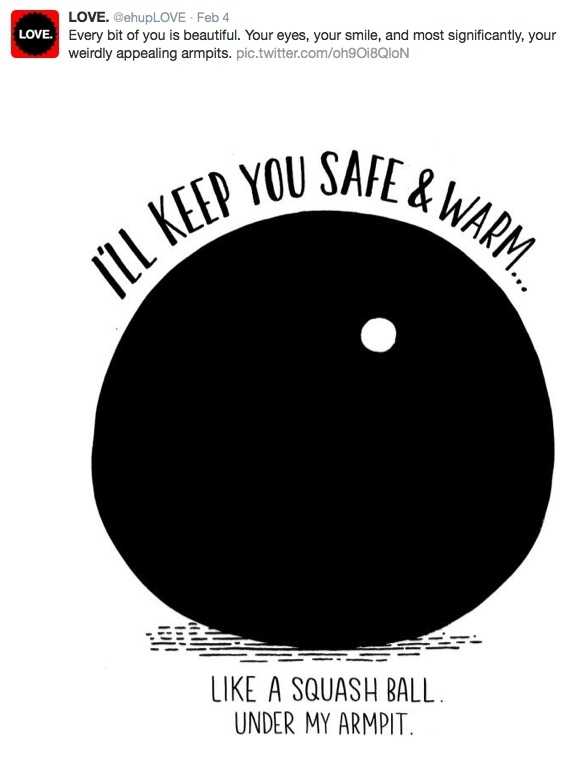 Love, an advertising agency have teamed up with illustrator Dave Anderson to celebrate Valentine’s Day 2014. They have uploaded an exclusive illustration of interpretations of love, every day through February. Each week they will give away 7 t-shirts with the designs from that week to those who tweet the most sincere, witty, poignant and stunningly beautiful messages of love. “It’s kind of like an advent calendar, but without the chocolate, and in February, and on Twitter,” Love said. Love are using Valentine’s Day as an opportunity to have fun with social media and have taken this chance to engage with customers by encouraging them to join in with the Valentine’s fun and interact with the brand. 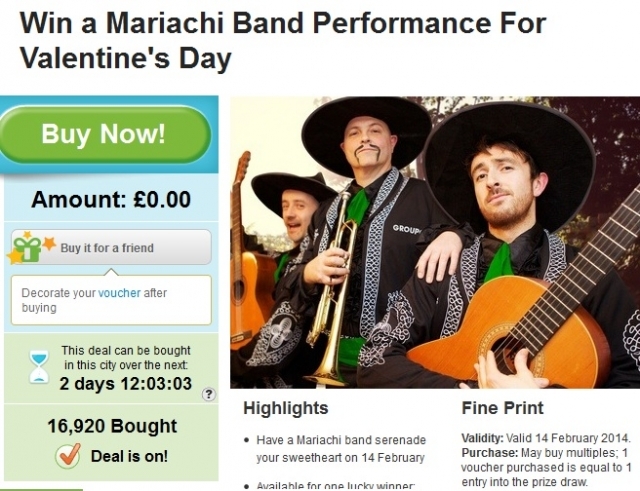 Groupon have come up with a completely unique Valentine’s Day gift for 2014. They are offering one lucky person the chance to have a Mariachi band serenade them. Just under 17,000 people have signed up to this free competition which will see an authentic Mexican folk band turn up to their chosen location. They will perform for them and their sweetheart on the special day. Fancy a slice of action? 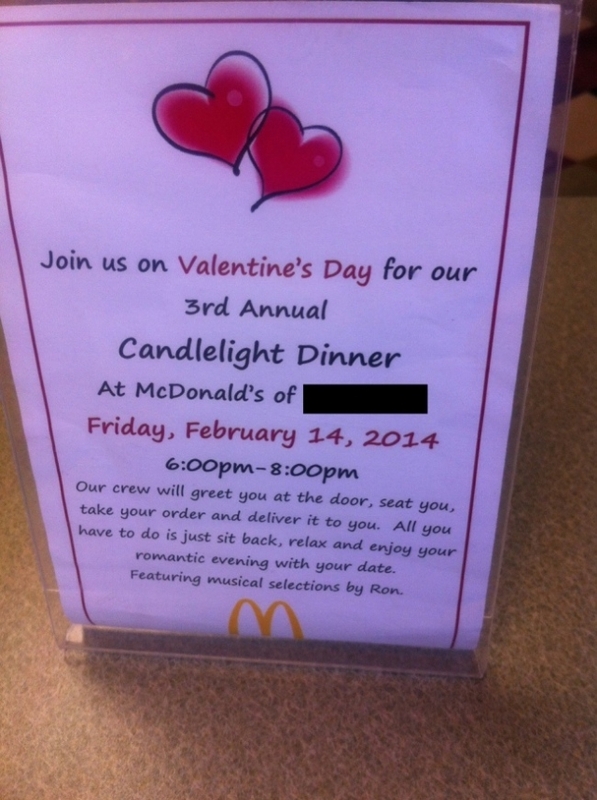 Nearly every woman dreams of a romantic candlelight dinner with their loved one on Valentine’s Day. It is a dream to be told you will be greeted, seated and able to sit back, relax and enjoy your romantic evening with your date. However I’m sure that most women would be horrified once they were told this would all happen at the fast food chain restaurant McDonalds. Maybe they would be more inclined once they knew it featured musical selections by Ron.